Hanukkah may be a couple weeks past, but that doesn’t stop the ghost of Juda Macabee and his War on Christmas Latkes. This is a Mr. Fakie original recipe that was going to be part of a Vegan cookbook/video/zine. Until then, enjoy the magic (and simplicity) of the potato, onions, and matzo! 1 Large frying pan or deep electric skillet. Peel and cut 2 potatoes into 1 inch cubes and place in a small pot of boiling water. When you can stick a fork easily in the potatoes, they are ready to be drained and mashed. While the potatoes are boiling, use a vegetable grater to grate the entire onion into a large bowl. Take the grated onion and squeeze as much of the onion juice out. Return the grated onions to the bowl. Less water = better frying. Now grate the other two potatoes into the same bowl as the onions. Now mix the mashed potato mix into the bowl of shredded potato onion mix and the second bag of matzo meal. Combine the two until you can make a solid hand patty. If you have an electric skillet , get a deep pool of canola oil in there, get it hot and start frying. I like to use an electric skillet but a deep frying pan can do the same. I get it up to 400F and have about 2 inches of oil in it. 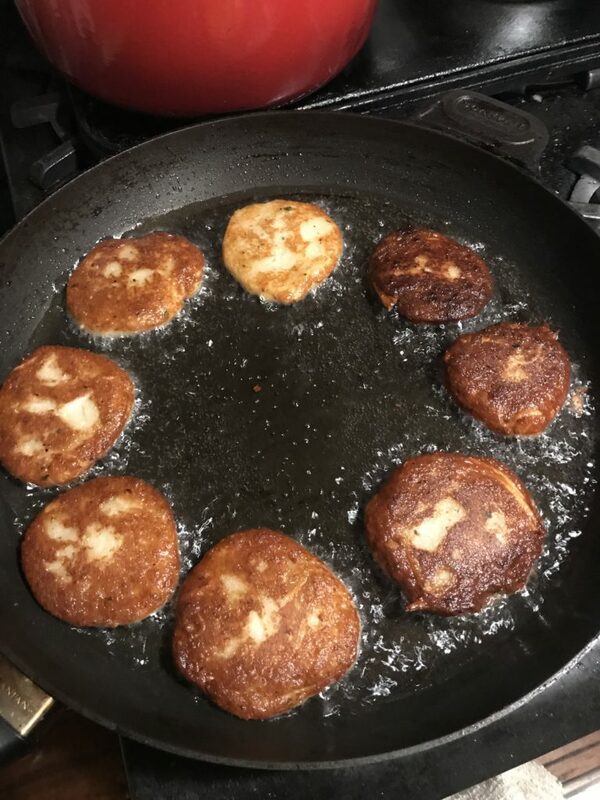 This makes for a fully crisped Latke. Serve with a tart apple sauce and vegan sour cream! Consider steamed broccoli as a side.